The recommended replacement is the DS9093A Angled Fobs. The DS9106 iButton halos are 0.25mm, thin vinyl labels wich slide over iButtons which are to be labeled with text, pictures, or numeric information. The halo is retained by a friction fit to the iButton it is pressed onto. The halo itself is blank. Readable graphics are added using commercially available label printers such as the P-Touch™ series of products from BROTHER and the VARITRONICS EasyStep™ Label Printers. These manufacturers also offer software support for IBM- and MAC-compatible computers. 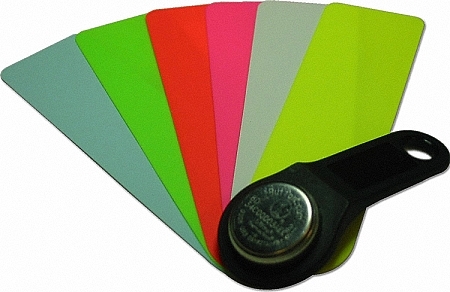 For best visibility and contrast, the labels should be printed black on transparent film. With their adhesive backing, they then mount on the iButton halo label.